Ahh yes -- good old ICQ -- those were the days. Fire up the ICQ while sifting the seeds out of my AOL CD case / pot-tray. Wow does this crap still exist? TIL: ICQ is still a thing. Used to be the greatest thing since sliced bread. The only reason I ever used this messenger was because it was the first instant messenger on the internet literally, and I used to play Ultima Online, which is arguable still one of the better MMOs out there in comparison of features and rules sets. and well I despise this after they forced a password policy change and if you were using a 3rd party messenger you didn't get a notification about the password policy change and you got locked out of your account. ICQ 6.5 as with 6.0 is essentially the same bloatware. We (ICQ users) want it to be slim, fast and take less then 10Mb ram at any given time. Can you manage that? well you could with 5.1... so WTF? it should take now 60-80Mb and work so slow? Disappointing. Oh well, still got 5.1 (yes, it can be still used). ICQ was great when Mirabilis owned it. Once AOL acquired Mirabilis things just headed downhill. Slow release cycles. Buggy releases. The program became enormously bloated. AOL finally went the Lite route but they went too far the other direction and left out important features. AOL killed off the use of ICQ for the vast majority of people who once loved it. The new look is interesting but I'd prefer more normal than flashy. I still have my old original UIN. I've moved on to other things. I remember when MSN Messenger was garbage and ICQ was awesome. Now Windows Live Messenger is hands and shoulders above ICQ. AOL doomed ICQ when it became the owner of two IM clients (AIM & ICQ) and effectively brought about the death of ICQ as a competitor in the IM universe. I've used the newer versions including this one. It works. It still has the basic characteristics of the original program. I moved on. I'm rating this a 3 because it does what is intended. I can't give higher because I feel the product is inferior to what it should be given its history and what it could be if they spent more time working on it. I would like to give it a lower mark but I cannot because it does do what it is supposed to. I was one of the early users of ICQ and my first IM program with its unique "uh-oh" notification sound. It was hip, it was cool, now its just unwanted. Most have moved on to other IM programs or a unified one. I know those on my list left it so I left it though my signon might still work. It looks nice enough but not needed anymore. Cons: No one uses it anymore. Bottom Line: Ahh yes -- good old ICQ -- those were the days. Fire up the ICQ while sifting the seeds out of my AOL CD case / pot-tray. Yea, 10 years ago ICQ was cool. 10 years is a long time ago. No one uses this anymore. Let it go. I like it, It has some useful features and looks pretty decent.It works fairly well.I am glad they finally updated it.It has been such a long time. 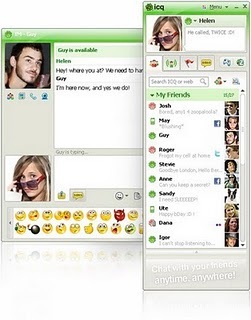 I miss the old 2001/2002-versions of ICQ. This is just too messy. Besides, how many use ICQ these days? I've been using the old "Mirabilis ICQ Pro 2003b 3916" since my Windows 98SE days and still prefer it much better than the new versions.